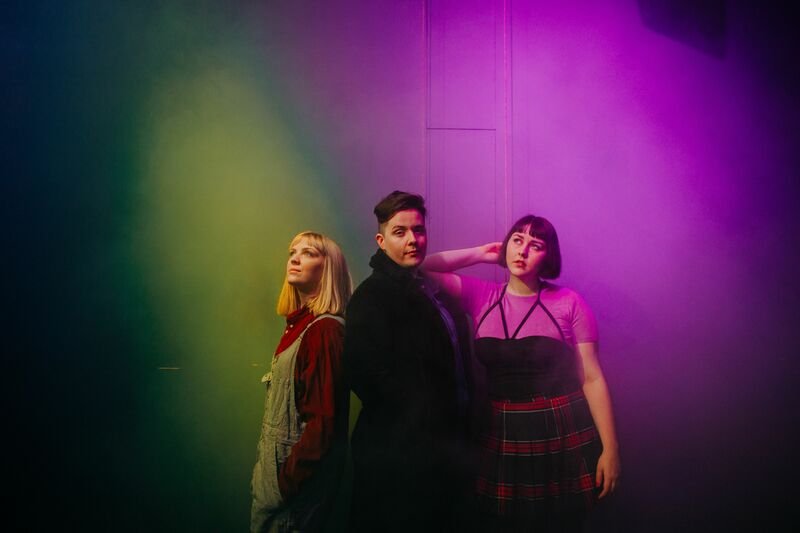 Cheylene from Belfast trio, Beauty Sleep, tells Aoife Mawn their plans for the future, their best gig ever and the five items that define them. Share the post "A virtual chat with Beauty Sleep"
There was a lot of chat about music that night, so we definitely knew we had the same kind of influences! Also, me [Cheylene] and Ryan already knew each other and had written some songs prior to the party, so we already knew there was something interesting there. We didn’t overthink any of it though. I think at every point, me and Ryan writing songs; meeting Aimee and forming a band; it just felt right. We joke a lot about how we kind of tried to ‘woo’ Aimee into being in our band after meeting her, rooting through her Spotify playlists, liking her posts, orchestrating ways to hang out with her, I even think we cooked her dinner at one point! Beauty Sleep recently performed at the Output festival. How did you find that experience? It was amazing and hectic! A really packed out and lively show, lots of dancing! It was the first show we’ve played since announcing our album as well, so we were really excited to let rip with the new songs and got some really lovely feedback. Who are your biggest influences, and which of them would you most like to work with? We all love St. Vincent. She’s such an inspiration! If we got to make an album with her we wouldn’t know what to do with ourselves. Grimes, Tame Impala, Phoenix are all amazing as well, but influences and inspiration for our music come from everywhere, all our experiences and the awesome people in our lives. What is the best gig you’ve played? Best gig – our label’s fourth birthday party in Elmwood Hall last December. We put a lot of work into the production, brought in some extra players and it was the first time we’d played some of the songs on the album, which was thrilling. Plus the whole night was an epic celebration. So much fun! What’s your plan for the summer? Are you playing festivals alongside touring the new album? Summer plans are to play as many festivals as possible and enjoy ourselves as much as possible! We were in the studio so much last summer that we’re really excited to be OUTSIDE this year, enjoying the release of our album. Have you finished the album yet? How would you describe the sound? The album is done! We’re so excited and proud of it. It’s about being kind to yourself and others and trying to be a good human, which is why we called it Be Kind. We put in a lot of effort to explore and showcase as many sides of the band as we could, so hopefully it takes people on a journey. There’s a lot of dreamy synths and groovy bass lines, a lot of harmonies and percussion. What other Irish bands are you loving at the minute? AE Mak, Pillow Queens, CATALAN, Girlfriend, Ryan Vail, KILMANANA, Son of the Hound… too many to mention, to be honest. This island is full of talent! Finally, if I wanted to summon your spirit, what five items would I burn in my cauldron? Juno synthesizers, colourful bath bombs, gin, blueberries and a lot of curse words. Next articleThe Fulcrum Building: a new-new-Student Centre for UCD.